The 2016 Annual APIPA Conference will take place from July 25-29, 2016, in beautiful Pohnpei, FSM. Join hundreds of participants from throughout the Pacific: July 25-29, 2016, Pohnpei, FSM. Join the regional public auditors for the 2016 Annual APIPA Conference, scheduled for July 25-29, 2016, in Pohnpei, FSM. APIPA features world-class instructors with experience as practitioners in their fields. Join us July 25-29, 2016, in Pohnpei, FSM. Join us for the 2016 Annual APIPA Conference, scheduled for July 25-29, 2016, in Pohnpei, FSM. Kaselehlie and Welcome. “Fishing Together for a Pacific Free of Corruption and Poverty” is the theme for the 2016 27th Annual Conference of the Association of Pacific Islands Public Auditors (APIPA). This year's Conference will be held in the State of Pohnpei, Capital of the Federated States of Micronesia, from July 25–29, 2016. Our Pohnpei Office of the Public Auditor is pleased to host the 2016 Conference. 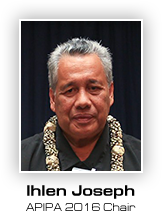 A program for the week of the APIPA Conference has been developed in collaboration with the Graduate School USA's PITI-VITI Program, and has been made available on this website. The College of Micronesia-FSM National Campus facilities in Palikir, Pohnpei will again serve as venue for the APIPA Conference and its related activities. The Deputy Inspector General of the U. S. Department of the Interior, Ms. Mary L. Kendall, will deliver the Keynote Address on the opening day of the 2016 APIPA Conference. Deputy Inspector General Kendall will also facilitate a session on “Challenges and Opportunities for Running an Audit Office” for APIPA principals and their key staff. We are honored to welcome Ms. Kendall to the 27th APIPA Conference. The 2016 APIPA conference will offer four tracks: 1) Audit, 2) Audit Supervisory, 3) Finance and 4) Accounting & Management. We encourage participants to select the courses best-suited for their continuing professional educational needs. Instructors will include Mr. Frank Crawford, Mr. Bruce Crandlemire, Ms. Jeanne Yamamura, Mr. Dave Hancox and Ms. Diane Arakaki. To them, we extend our deep appreciation and warm welcome to Pohnpei and to the 27th APIPA Conference. To assist your planning and preparation for attending the 2016 APIPA Conference, we have included extensive information on this website. Please feel free to explore its resources, and to contact the APIPA 2016 Secretariat with any questions or concerns. We look forward to welcoming you to Pohnpei and to the 27th Annual APIPA Conference. Copyright © 2016 Association of Pacific Island Public Auditors (APIPA).